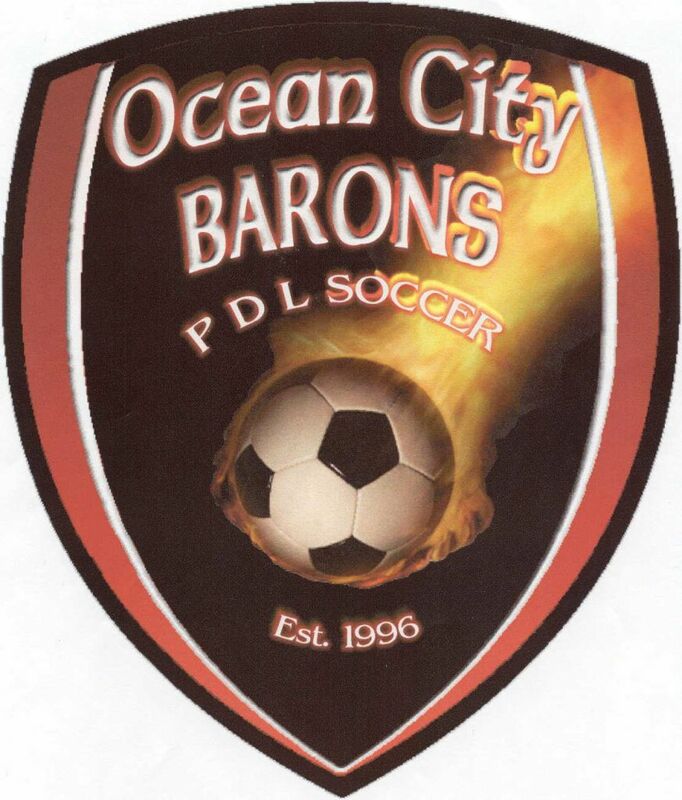 After being founded in 1996, the club debuted in the 1997 season and was named the South Jersey Barons. They joined the United Soccer Leagues (USL) as a professional team, competing in the Second Division (two levels down from MLS), which at the time was called the D-3 Pro League. In 1998, in only their second year in existence, the Barons won the Mid-Atlantic Division title. The next year, they followed that up with a second straight playoff appearance and a run to the USISL D-3 national championship game. On September 11, 1999, the Barons, playing the title game on the road, lost 2-1 to the Western Mass Pioneers. The Barons made a third straight playoff appearance in 2000, but would struggle for the next three years, never finishing above fourth place in the division. In 2003, the Barons moved to the PDL, and after finishing in fourth place in their first season, they made history in their second season in the league. They became only the fifth team ever to go through the regular season with an unbeaten record (14-0-4). They won the Northeast Division title that year, but their season would come to an end in the playoffs. In the conference championship game at McPherson Stadium in Greensboro, NC, they lost to the Carolina Dynamo, 3-2, on a heartbreaking goal in the 90th minute. In 2005, the South Jersey Barons were taken over by a local businessmen, Giancarlo Granese. Their first act as new owners was to move the Barons to Ocean City, NJ and rename the team the Ocean City Barons. The club moved into its new home at Carey Stadium on Atlantic Avenue between 5th and 6th streets. The Barons continue to benefit from the athletic facilities that run adjacent to the stadium, along with the floodlights that the city installed that allow all home games to be played in the evening. 2006 marked the 10th season for the Barons organization, but on the field, despite finishing with a winning record, it was considered a down year by club standards. The Barons finished with a 6-4-6 record, which was good enough for second place in the Northeast Division, and they missed the playoffs for the first time since moving to the PDL. The Barons’ home unbeaten streak finally came to an end on July 16 when they lost 2-1 to the Ottawa Fury. The home unbeaten streak, which still stands as a PDL record, ended at 27 games. The 2008 campaign was a tale of two halves as the club suffered it’s worst season since joining the PDL. Even with it being the worst season, they still managed a winning record with six wins, five losses, and five draws. The first half of the season, the Barons were unbeaten, with a record of 4-0-4, but the second half of the season was a different story, finishing with a 2-5-1 record. Some of the highlights included Byron Carmichael becoming the club’s all-time leader in goals and points while finishing the season with an even 100 points. Ocean City’s 8-1 win over the expansion New Jersey Rangers was a historic one as Steve Miller scored the club’s third hat trick in franchise history and it was the most goals scored in a game and the largest margin of victory that the club has ever enjoyed. The club rebranded itself after the 2009 season, becoming the Ocean City Nor’easters and adopting the color scheme (royal blue & white) of English club Reading FC. However, in their first season with their new identity in 2010, the team struggled, finishing with a 5-6-5 record, their first losing season since they joined the PDL in 2003. By and large, the team featured a very young, inexperienced roster and failed to qualify for the post-season and the Lamar Hunt U.S. Open Cup. The season could have been different with a few different bounces of the ball, as four of the six losses suffered were by one goal. (2010 Season Review). The 2011 season was one of high promise that teetered on the edge of success. The Nor’easters finished with a 2-6-8 record knowing that if they had turned the ties into victories, then the season would have had an entirely different look to it. The young players from the U20 Men continue to push into the first team, and the Nor’easters Academy is already proving successful with the likes of Mitch Grotti, Jerry Guzzo, and Gio Tacconelli all graduating to the PDL first team in 2011. (2011 Season Review). The club's 20th season (in 2016) was one to remember as the Nor'easters made a return to the PDL playoffs. After finishing just shy of a division title, a second place finish in the Mid-Atlantic Division was good enough to qualify for the postseason. And the Nor'easters made the most of their trip to the playoffs by defeating three division champions (GPS Portland Phoenix, Charlotte Eagles,and Reading United AC), winning the Eastern Conference title and advancing to the PDL Semifinals for the second time in four years. Unfortunately, the playoff run would come to an end there as they were defeated by the Calgary Foothills FC. The 2017 season saw the Nor'easters make a change to the coaching staff and the front office as the club welcomed former PDL Defender of the Year and two-time All-PDL selection John Thompson back to Ocean City as the head coach of the PDL team. With Thompson taking the reigns, Tim Oswald, the club's winningest PDL coach in club history, moved to a front office position as Sporting Oswald. Since joining the PDL in 2003, the Nor’easters have the seventh best regular season record (139-65-44) and the fourth best home record (76-26-23). The club is 61-24-21 since moving to Ocean City in 2005 (at Carey Stadium and occasional games at Tennessee Avenue Soccer Complex), which is the sixth-best mark during that period, showing that the home fans at the Beach House make all the difference. Adding to their success in the league, the Barons have also qualified for the Lamar Hunt US Open Cup on five occasions. They made their first appearance in 2002, their final year as a professional franchise. That year, they defeated Vereinigung Erzgebirge (Eastern Pennsylvania) of the USASA 4-0 in the first round but were eliminated in the next round 1-0 by the Hampton Roads Mariners, who played on the level above the Barons, in the A-League (the league just below MLS). In 2004, the year of their undefeated league season in the PDL, they began the tournament with a 5-0 thrashing of the USASA’s Allied SC, and once again met an A-League team in the second round. The Syracuse Salty Dogs were the club, which featured Anthony Maher, the older brother of the Barons’ Matt Maher. It was only the second time in the history of the Open Cup that two brothers played against each other in a Cup game. The original match seemed to be heading in the Barons’ direction in the 75th minute with the score tied at 1-1, and the Salty Dogs were playing with nine men. Unfortunately for the underdogs, the referee abandoned the match at that point due to lightning and darkness. Six days later, the match was replayed, Syracuse was too strong, knocking the Barons out of the tournament by the score of 4-2. The following year, the Barons made a return to the Cup and made an enormous impression. They began as they had the previous two tournament appearances with a shutout win over a USASA club, 3-0 over the New York Greek-American Atlas. The Barons would host their second round match against the Long Island Rough Riders of the USL Second Division, and they used their home field advantage at Carey Stadium to thrash the Rough Riders 4-0. Ruben Mingo, Tony Donatelli, Chris Williams and Steven Wacker all scored in one of the second round’s biggest upsets. In the Third Round, the Barons were on the short end of a historical Open Cup match in Richmond, VA. Again, weather played a role, postponing the original game date, and a week later, the match was delayed by two hours. When the match was finally completed, the Barons had lost to the Richmond Kickers of the USL First Division, 8-4. The Kickers answered Byron Carmichael’s opening goal, with four straight tallies in the first half. Just before halftime, Carmichael cut the lead to two, and just after the break Tony Donatelli’s goal made it 4-3 in the 54th minute. However, the home side was too strong, and with the Barons pushing for an equalizer, the Kickers opened the floodgates. 12 goals were a total goals scored in an Open Cup match since professional teams began entering the tournament in 1995. The four goals conceded by the Richmond Kickers was the most they had allowed in their Open Cup history. After missing out on the tournament in 2006, the Barons returned to the Cup in 2007 and began at home with a 1-0 upset over Crystal Palace Baltimore of the USL Second Division. They hosted the Second Round as well and lost 2-1 to the Harrisburg City Islanders in one of the most exciting matches of the 2007 Open Cup. The Barons had three balls cleared off the line in the second half, but they weren’t able to equalize, and the City Islanders would move on to make a dramatic run to the quarterfinals. The Ocean City Nor'easters celebrate after upsetting the Pittsburgh Riverhounds in the Second Round of the 2013 Lamar Hunt US Open Cup. 2009 was a landmark season for the Barons in the Open Cup as they qualified for the tournament for the fourth time in the last six years. But the biggest highlight was the fact that Ocean City faced off with a club from Major League Soccer for the first time in franchise history. The Barons’ run in the tournament began with a shocking 3-0 home upset of Crystal Palace Baltimore of the USL Second Division. Byron Carmichael was named TheCup.us Player of the Round after scoring a pair of first-half goals and JT Noone would put the nail in the coffin with a second half goal. The upsets at The Beach House continued in Round 2 when the Barons’ Tunde Ogunbiyi shutout Real Maryland of the Second Division and Noone converted a penalty kick in the second period of overtime to put the Barons into the Third Round. With the win, Ocean City became only the sixth amateur team in the Modern Era of the US Open Cup to register back-to-back wins over professional teams. Ogunbiyi became the first PDL goalkeeper (and just the third amateur GK) in the Modern Era to shutout back-to-back professional teams. The Barons would put a scare into DC United of Major League Soccer, but they would fall 2-0 to the defending Open Cup champs on a wet night at, the Maryland Soccerplex in Germantown, Md. The Nor'easters were back at it again in 2013 with another extended US Open Cup run. They first opponents in Round 1 were the New York Red Bulls U23s at Carey Stadium. The Nor'easters came out strong and blew their opponents away 2-0 with goals from Duke Lacroix and Nick Perea. The second round saw a professional team from USL Pro, Pittsburgh Riverhounds, come to Ocean City to challenge the Nor'easters on the Shore. This was a tighter affair, but the Riverhounds were beaten 1-0 by the home team with the goal coming from Ken Tribbett who smashed the ball home after it bounced around in the penalty area. The Third Round saw the Nor'easters drawn at home to MLS side Philadelphia Union, but the Cup organizers switched the game to PPL Park. In what was a close and exhilarating game the college kids pushed the pros all the way to the end before losing 2-1. The score was 0-0 at half time, but Jack McInerney scored just after the break, many thought the floodgates had opened, but the Nor'easters equalized through Emanuel Kollie. It was an injury time winner from Union midfielder Brian Carroll in the 93rd minute that sealed the Nor'easters fate. Qualifying for the second consecutive season in 2014, the Nor'easters failed to match their success of the previous season, falling to US National Cup Champions, New York American Greek Atlas, 2-0. In 2017, the Nor'easters returned to the US Open Cup and kicked off their cup run with a 3-1 home win over Junior Lone Star FC, an amateur team from the Philadelphia Premier Soccer League. This set up another meeting between Ocean City and the Harrisburg City Islanders at The Beach House. In a rematch of the 2007 US Open Cup, the Nor'easters held the City Islanders to a scoreless draw through 120 minutes. For the first time in Nor'easters club history, they had to decide a match from the penalty spot. It took seven rounds of penalty kicks, but unfortunately, the professional side prevailed, 6-5. The Nor'easters' have had a lot of success in the US Open Cup playing games in front of their home fans. They would be tested in 2018 when all three games were played on the road. In Round 1, they traveled to Ypsilanti, Mich. where they blanked NPSL power AFC Ann Arbor, 3-0. The following week, the Storm traveled to North Carolina to take on the Charlotte Independence, a professional team in the United Soccer League. The Nor'easters would add another pro team upset to their resume as Kyle Gurrieri scored two goals in the opening seven minutes to lead them to a 3-1 win. Ocean City would return to North Carolina a week later, but the USL's North Carolina FC (featuring Ocean City alum Steven Miller) were too much, ending the Storm's Cup run, 4-1. As a PDL team in the Lamar Hunt US Open Cup, Ocean City has 12 wins with six of them being upsets of professional clubs. Only two amateur clubs (Michigan Bucks with nine, Des Moines Menace with seven) have eliminated more pro teams. However, five of those six wins were shutouts and no amateur team in the country has more shutouts of professional teams (6) than Ocean City. In 2005, the Ocean City Nor’easters were recognized during the USL Annual General Meeting for the success made since the move to Ocean City and were awarded the "Progress Award," an award given to just one of the 114 professional and amateur teams in the USL. In 2006, the club was again recognized during the USL AGM and inducted into the USL Hall of Fame as a "10+ Club," for being one of only 34 franchises in the history of the USL to have been around for 10 or more years. In 2007, the Nor’easters’ Communications department, led by public relations director and broadcaster Josh Hakala, was honored with the PDL Communications Award. For the fourth straight year, the club was honored at the USL’s AGM in 2008 when they were named the PDL Organization of the Year out of the 67 teams in the league. In 2012, the Nor’easters were recognized for the great strides they made as a club by being nominated for the USL Progress Award. It is an honor to achieve that award, but they know that now the expectations are high for an even better 2013. The Nor’easters have had success in helping players achieve their goal to play the game professionally. More than 50 players have moved on to the pros in Major League Soccer, the United Soccer League and dozens of countries around the world. Full list of former Ocean City players playing in the pros here. Every statistic available from every season of the Ocean City Nor'easters' club history.